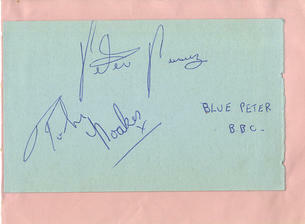 This is an In Person signed autograph album page by the two former Blue Peter Presenters. The size is 5" x 3" but has been laid down onto a larger album page approx 5.5" x 4". On the reverse has been written " Cardiff New Theatre " 23rg August 1975 which is where, and when, they appeared there. John Noakes (born 6 March 1934, Shelf, near Halifax, Yorkshire) was a British television presenter and personality, best known for co-presenting the BBC children's magazine programme Blue Peter in the 1960s and 1970s. He remains the show's longest-serving presenter, with a stint that lasted 12 years and 6 months. Peter Purves (born 10 February 1939) is an English television presenter and actor. Purves was born in New Longton, near Preston, Lancashire, and was educated at the independent Arnold School in Blackpool, he had originally planned to go into teaching, training at Alsager College of Education, but began to act with the Barrow-in-Furness Repertory Company instead. He also attended Manchester Polytechnic.